If you are the owner of a brand-new smoker, you may have come across several recommendations to “season” it before trying it out. This is often very confusing for anyone new at smoking meat because manufacturer instructions typically do not contain any information about seasoning a new smoker. If this is something that has been on your mind, you have come to the right place. It is important to start out on the right track if you want your smoker to deliver the best results. Continue reading to learn what it means to season a smoker and how to get started. 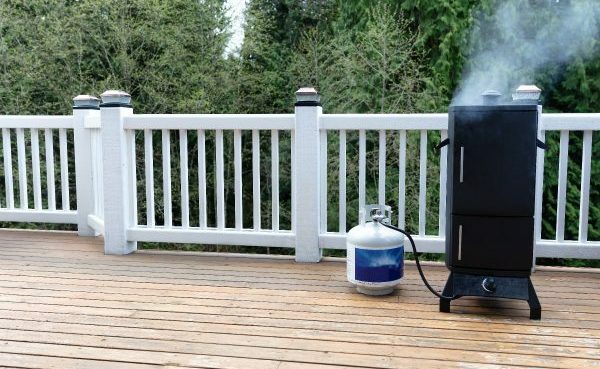 When a new smoker is packed and shipped out from the manufacturer, it is common practice to spray the smoker exterior with oil in order to protect its surface and prevent rust formation. Whether you ordered your smoker online and had it shipped directly to your home, or purchased it at the store location, it will have this layer of oil intact. If you were to move forward with using your new smoker with this layer of oil on its surface, it would negatively affect the flavor and quality of anything you cook inside. It can even contaminate any meat, cheese, or vegetables you smoke. Fortunately, seasoning a new smoker is very simple. In fact, it should just be called “heating up your smoker before using it.” All you have to do is set up your smoker, turn it to 250° Fahrenheit (120° Celsius), and allow smoke to pass through it for up to an hour (smoke for at least 30 minutes). It is also recommended to first spray the interior of the smoker with the standard cooking spray such as Pam®. After 30 to 60 minutes of smoking, your smoker should be safe and ready to use! To ensure that it is ready, allow the smoker to cool down completely and then open its chambers to smell the inside. If you can detect the odor of oil, you need to continue the seasoning process for a little longer. If the inside of the smoker smells like nothing, you are good to go! The process of seasoning eliminates all of the lingering oil and petroleum residue on the surface of your smoker, making it an essential part of creating smoked masterpieces. Try Some Excellent Smoked BBQ in Carmel! If you are craving delicious barbecue and smoked meats, come to Rackz BBQ in Carmel for authentic flavors and great prices! We offer a wide selection of barbecue classics, house-made sides, and tasty desserts, all prepared using the freshest local ingredients. We also offer call ahead take out ordering and catering! Call 317-688-7290 to learn more about our current menu selections and specials, anytime. This entry was posted in Smoked Meats and tagged BBQ restaurant near me, season a new smoker, season a smoker, seasoning tips smoker, smoked meats carmel indiana, smoker seasoning. Bookmark the permalink.